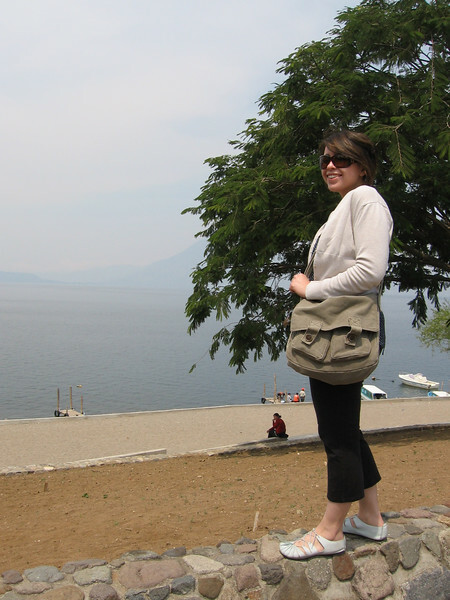 Me in front of Lake Atitlan in Guatemala on a very hazy day! Once you’re tired of eating whole beans, you can use your left overs and make some refried beans! 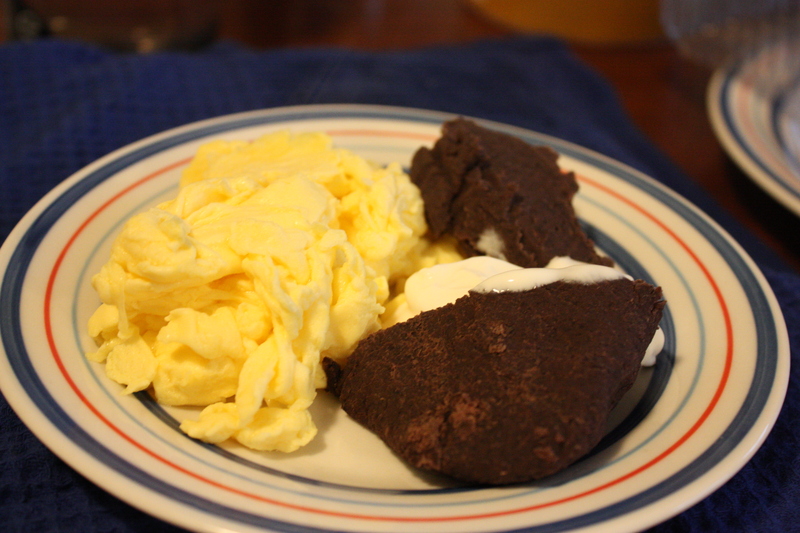 Growing up we had refried black beans, eggs and tortillas for breakfast on weekends. It’s still one of my favorite breakfasts (and I LOVE breakfast food). Soo good! 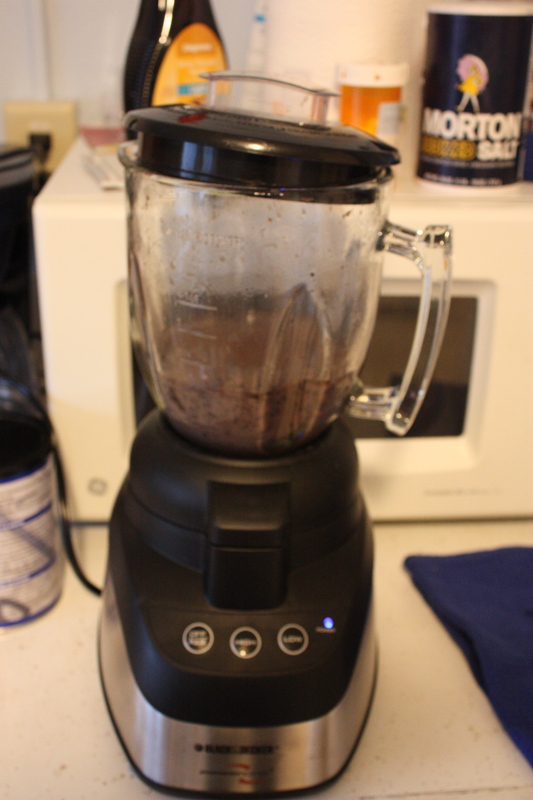 Step one: add as much beans as you want to make in the blender (I recommended two cups above but I only had about a cup). Add a little bit of the liquid and blend until smooth, almost like a thick soup. (You can stop here if you want to enjoy some frijoles licuados, essentially a black bean soup). 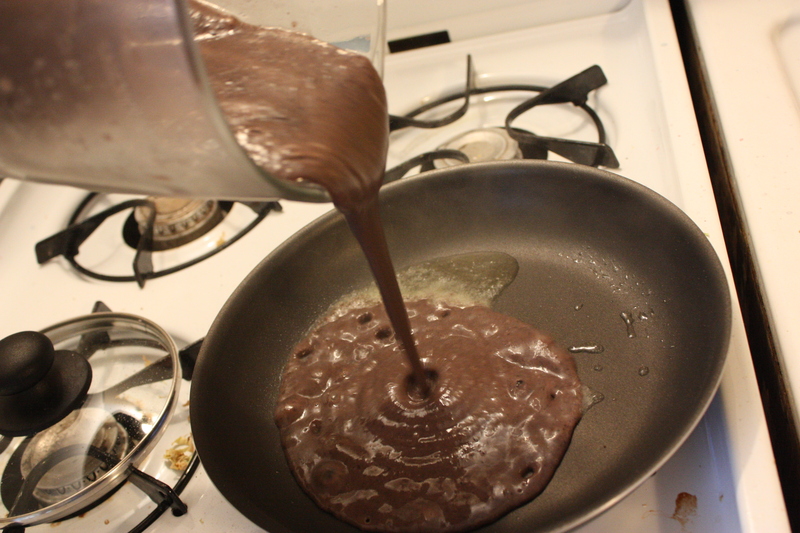 Step three: add blended beans to the pan. Stir until thick (this will take about 10 minutes), watch out for splashing beans! They burn! (My mom warns me about this every single time I tell her that I make these). Then as they thicken, it’ll start to separate from the pan, once you shake the pan and they form a solid log shape, turn them onto a plate. 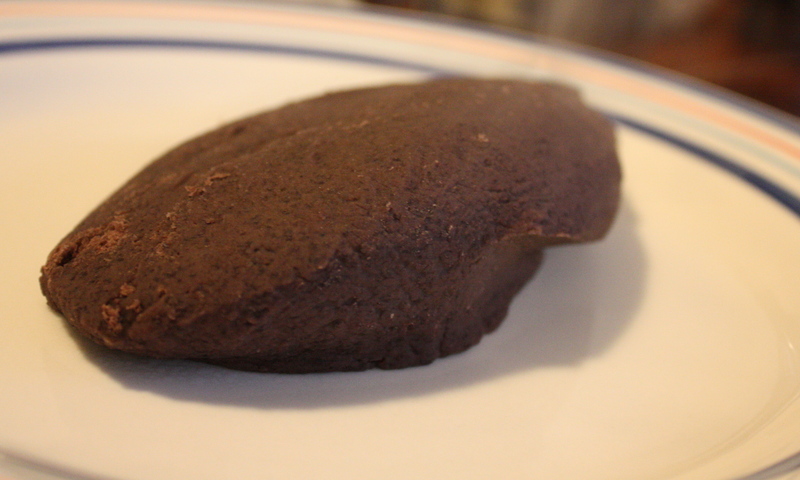 You can slice it with a butter knife to serve… Doesn’t look very cute, but tastes delicious! Step four: Enjoy with scrambled eggs, tortillas and sour cream or queso fresco! I wish I had nice thick corn tortilla and plantains. Unfortunately in upstate NY, they’ve only heard of flour tortillas and plantains don’t exist (I keep meaning to check the Asian market to double check this). Once you try these, you’ll never want to buy a can of refried beans again! In Other News… In case you hadn’t noticed… this site is now officially http://www.foodologie.com! Woo! I love your black bean recipe. Oh my! I am so going to make that. I haven’t seen them at Wegman’s 😦 I’ll keep looking, maybe I’m looking in the wrong place. Thanks for the tip! High heat I think is the trick. I use a wooden spoon not master skillet like she does! Pingback: Gone With the Wind « Newlywed, Newly Veg! These are great in the morning with some fresh eggs and tortillas. Try frying them in pork fat though! I spent about a year and a half in Guatemala and 7 or 8 months in Belize. I couldn’t get enough of the refried black beans. Thank you so much for posting this!! I still love to make Guatemalan breakfasts and make my own corn tortillas by hand. Add a little sour cream to these and eat them with a mouthful of thick hot corn tortillas and your in heaven. Thanks for posting this. I was in Guatemala last year and became hooked on it. I have discovered the Ducal brand refried black beans, which is a Guatemalan brand and tastes okay. I just made yours this morning and they are really good, though I am cooking the beans a little longer with a touch of bacon fat. I wonder if the brand of dry black beans makes a difference? Thanks so much for sharing. Sounds exactly like how the Guatemalan family I lived with made them. To get the thick corn tortillas I make them myself using Maseca corn flour. Taste almost like the real thing.